Stylos is a traditional Cretan village in the Apokoronas area, not far from Almyrida. Stylos is famous for its giant plane trees, natural spring water and Diktamos Gorge. Stylos is not touristy at all and the tavernas are usually half full with locals.The complimentary Tsikoudia (Raki) and delightful platter of fresh fruits ended a lovely eating experience. The house is well furnished, nestled in the hills, surrounded by beautiful mountain and sea views. Built to a high standard in 2008, the bungalow offers a peaceful and relaxing holiday for each of our holidaymakers. From a very large roof terrace you can admire amazing views. The villa also have a large pool and pool side BBQ. This is a private villa. My family and I have spent many holidays there. When we are not using the villa ourselves, we are renting it out hopping to share our great holiday experience with others. My villa is a place for family or couples who seek a peaceful holiday not too far away from sandy beaches, cafe's and restaurants. 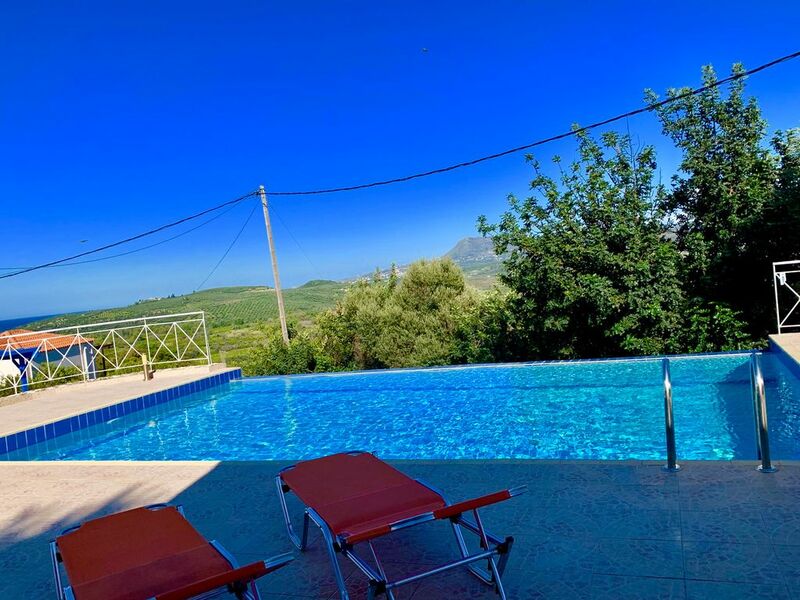 The villa has a very nice private pool with great sea and mountain views. Bathroom has bath with shower over, wc, wash basin and washing machine. Ground floor also has open plan living area with DVD player and satellite TV. Kitchen fully equipped with cooker, hob, microwave, dishwasher, fridge/freezer, toaster, kettle, coffee maker. Full range of cooking utensils, crockery and cutlery. Notes on accommodation: Single storey air-conditioned villa with large roof terrace. Outside: Tiled terrace to the front of the villas. Sun loungers, parasols are provided. Out door dinning table and chairs are also provided for alfresco dinning. Pool side barbecue kitchen with sink cupboards and serving worktop. Utility Room: An ironing board, iron, clothes airer and hair dryers are provided. Cleaning / Towels / Linen / Maid service: Quality towels and all linen are included, but excluding beach towels. The property will receive a full clean prior to guest arrival. If guests require further linen or towel change during their stay this can be arranged for a small fee. Other: There is a sofa bed in the living room to accommodate up to two extra people in each house. There are terraces and gardens. The grounds are tidy, clean and well maintained. The villa is child friendly. Pros: This little villa is excellent for couples who want a quiet stay. Instead of renting a huge 3 or 4 bed place, this little unit is ideal for two people and no loud noisy parties from big groups or children in the area. The best thing about this property is the pool and views, absolutely amazing. The villa itself was spotlessly clean and the kitchen is well appointed for cooking at home if you don’t feel like going out. The location is great, only about a five minute drive into the village which has several restaurants and shops. It is not super touristy, just a nice, relaxed atmosphere. The owner Wendy was very nice and helpful both throughout booking and while we were there and the manager Jimmy stopped by once to check on us and he was super nice. There is a little neighborhood kitty up there that everyone looks after named Moussaka who is simply the sweetest cat I have ever met. Give him a pet for us. Cons: The villa is located at the end of a rather curvy gravel road, so a 4x4 would be advisable, with one scary drop off, so go slow. The chickens in the farm behind the villa can be loud at times when you are up at the pool. The villa is missing a few things such as cleaning supplies, bathmats, beach towels, kitchen towels, nothing major but you do need to purchase your own cleaning stuff since there is no weekly service provided (but they offer an inexpensive service if you want it). Stilos is well off the beaten track in the foothills of the White Mountains. If you want the bustle of the big town, this is not for you. But if what you want is a tranquil get away in an idyllic setting, then this property is for you. It isn't the most luxurious villa on the market, but the pool lifts it to another level. Great private property - away from crowd. Beautiful landscape. Nice apartement. Relaxing. We spent two holidays this year at this fantastic villa with two teenagers, although we were prepared for a basic villa as we paid such a reasonable price, we were thoroughly delighted with the accommodation and the location. The lovely sandy beach is only 10 minutes away, the villa was clean and the kitchen had all the essentials needed for cooking, The wonderful pool and the views were a real surprise considering how little we have paid for the villa. Wonderful holiday, the island has something for everyone and would recommend hiring a car to explore the island. We have just arrived back home after an amazing week! The house is wonderful! Modern, clean, and the best part is the huge terrace with absolutely gorgeous views! we couldn't have asked for anything more. A big thank you to Wendy for allowing us to enjoy the beautiful house. We've had a wonderful time in Stylos Retreat and I would highly recommend the house to all those looking for a comfortable, quiet place to spend their vacation. We've just come back from a week long stay at this villa. It was well presented and spotlessly clean when we arrived. But without a doubt the best part was the big terrace with a gorgeous views overlooking both the sea and the mountains - truly a view we won't be forgetting. We also very much enjoyed having drinks and BBQ by the pool when we didn't feel like going out for dinner. Kylivas beach is 10 mins drive away, Almyrida is 15 mins away. Both are sandy beaches with gently sloping calm water which is ideal for children. It also offers excellent range of water sports, Numerous tavernas, internet cafes, bars, mini markets, shops, chemist, bakery, banks, etc. 15 minutes drive to Kalyves beach. Car use is recommended. Bike hire is available at Almyrida. Chania airport is only 20 minutes drive to the villas. Heraklion airport is 90 mins drive and has a larger selection of airlines. The drive from Heraklion is made easier by the National Highway. Detailed driving instructions are available from both airports to the villas. Car hire is available with Auto Club, Kalives Travel or any of the main companies at both Airports. Kalives is 10 mins drive away, the resort of Almyrida, Vamos is about 15 mins drive away, and the bustling town of Chania, with it's pretty Venetian harbour is about 20 mins drive away. 20 mins drive to Chania - a bustling Venetian harbour, where you will find scuba diving, boat trips, water slide park, Saturday morning market, banks and much, much more. Chania, once the capital of ancient Crete, offers quaint, narrow streets as well as a beautiful harbour lined with sea front tavernas and cafes serving excellent choice of sea food and local cuisine. Further afield, a water park at Limnoupolis, the biggest karting track in Crete, opportunities for boat trips from the harbour, historical sights such as the World War 2 Allied and German cemeteries. For those who enjoy walking, a visit to the Samaria Gorge is recommended, which meanders for 18km down a tortuous trail to the pretty resort of Agia Roumeli. Also the natural freshwater lake of Kournas provides a picturesque venue for lunch or a swim. Styllos itself has several tavernas and small supermarkets/shops. Neighbouring villages, Kikkino Chorio, Apetra, ect.. also provide tavernas. Vamos is the largest town close to villa. It has banks, 24hr Medical Centre, bakery, butchers, grocery shops and many tavernas. Booking Notes: To make a booking, you can either call or email me. 30% non refundable deposit payable at time of booking with balance payable 8 weeks prior to arrival. If booking made within 8 weeks, the full amount to be paid at time of booking. Payment can be made by bank transfer in Euros or Sterling. Changeover Day: No preference.